I'm sure she's the new fluffy pink Camellia growing on the edge of the Driveway Garden border. Yippee! A positive plant ID, for once - and I've found some photographs of this late blooming shrub. IN my garden she's a bit shy, and slow to flourish. Google searches can be rather disappointing, and Nonie Haydon isn't terribly flush with entries. She won a certificate in the 2010 Tampa Camellia Society for the following class: 'hybrid (w/no retic parent) unprotected'. And a daft older-lady gardener with far too much time on her hands tells the world (via her online journal, Tuesday 18th May 2010) she's found a Nonie Haydon Camellia label in her kitchen drawer. Oops - that was me! Nonie Haydon Camellia - Wet! Nonie Haydon has fluffy, informal blooms which photograph magnificently. 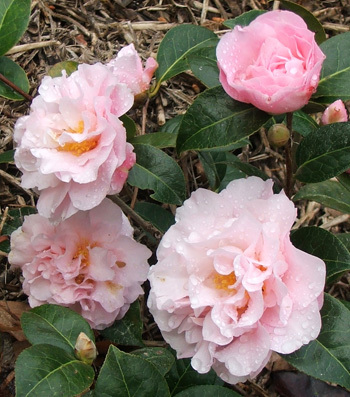 And, thanks to the American Camellia Society, I see that her breeder is a New Zealander, and she originated in the year 1990. In my garden she arrived (well, two of her, actually) in 2009 to take up a prime edge location in the new Driveway Garden. I'm thrilled that I scooped two of her up from the nursery sale table. I've planted both shrubs together. Now I'm wondering who Nonie actually is (or was). I'm assuming she's a woman? Camellias are usually girls (with apologies to Bob Hope) - well, the frilly pink ones certainly are. She blooms late in the Camellia season, but this may be because she's newly planted. Also her area of the garden is slower to warm up than others. I'll check this coming spring. 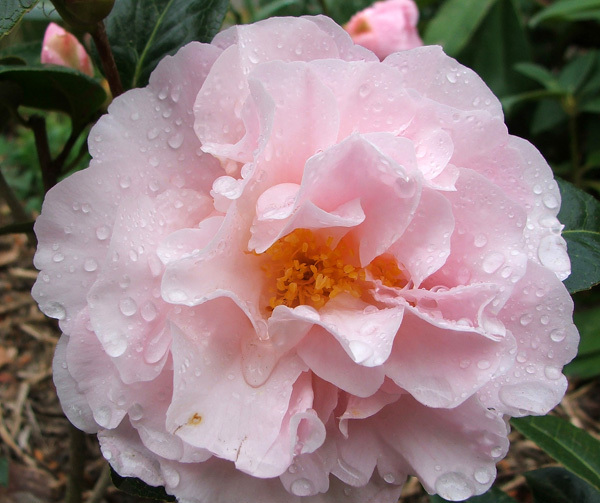 I really like the American Camellia Society's website. 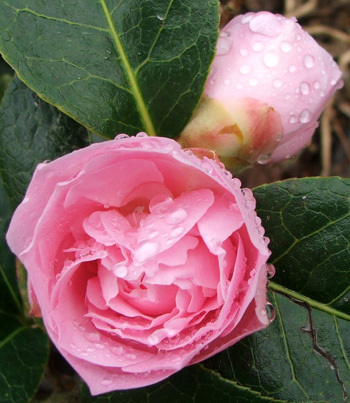 It makes me realise how little I know about Camellias (I knew that) - which is not a bad thing.